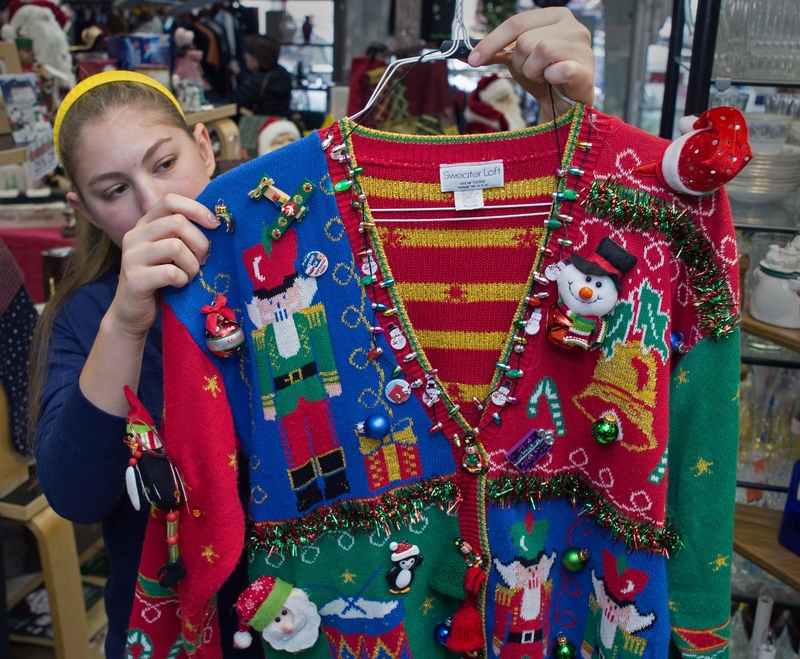 Deciding what to wear to an ugly Christmas sweater party is one of the most important choices you'll make this year, right up there with purchasing your first home or naming your first cat/dog/other baby stand in to appease your parents. Such an important decision should never be left until the last minute, lest all the good bad sweaters in your area get snapped up before you have the chance to get your mittened mitts on one. Not that I'm speaking from experience. Not that I'm speaking from an experience happening this very minute. Oh, I'll admit it: this year I was a total slacker, and all of the tackiest sweaters in my metro area have been snatched up by more enterprising folk than I. If you ask me, the second week of December is far too early for sweater sellout, but tacky Christmas sweater parties are now more popular than ever, and demand is as high as Santa's sleigh. While there are still places to buy sweaters online, browsing though professionally photographed and mass marketed sweaters just doesn't feel as authentic as digging though musty piles of knitwear at the local consignment shop, or accepting a thirty-year-old sweater four sizes too big that your friend is loaning you from her great-aunt's closet. True tackiness cannot be manufactured. It must ferment, like fine wine. If you've committed to a party but have nothing to wear, don't back out just yet: there are terrific alternatives to tacky sweaters all over the internet. While combining these techniques with a mothball-scented sweater would undoubtedly win you the honor of Tackiest Reveler at your party, by themselves they will distract people from noticing that you're a slacker who can't even be bothered to look for a sweater until the night before your annual party. If you're hell-bent on wearing a sweater, I applaud your determination. If you've got time and money to spend on materials in addition to the cost of a sweater, this abominably atrocious sweater boasts a fuzzy snowman and battery-powered lights. This hair bow's garish game is lacking on its own, but combined with the tutorial below it is a force to be reckoned with. Nothing screams "kitsch" like piling your hair up on top of your head and insisting you're a Dr. Seuss character all night long. On little kids this is adorable. On adults, it's so awful it's perfect for chugging eggnog and playing reindeer games. CutePolish might suggest doing one of these designs as an accent nail, but you and I both know that we're meant for greater, tackier things. We'll do all ten designs, possibly more if we can fit more than one design on each nail. Though precious as part of your restrained Christmas morning brunch, this mug alone is a sweater party weakling that can only be carried in addition to at least two other items on this list. How about the reindeer makeup and the reindeer bun? Be Rudolf on his night off. Fill your mug eggnog. And then drink it, because you're going to have a happy holiday.